If in New York City to see the attractions, rent a car for a day and explore some of the New York scenery while there. The Catskill Mountains can be seen within a couple of hours drive and are a nice retreat from city life. There you will see the beauty and serenity of nature. Woodstock is a small but charming town that can also be visited while in the area. And if you can plan an overnight, venture to the Niagara Falls. 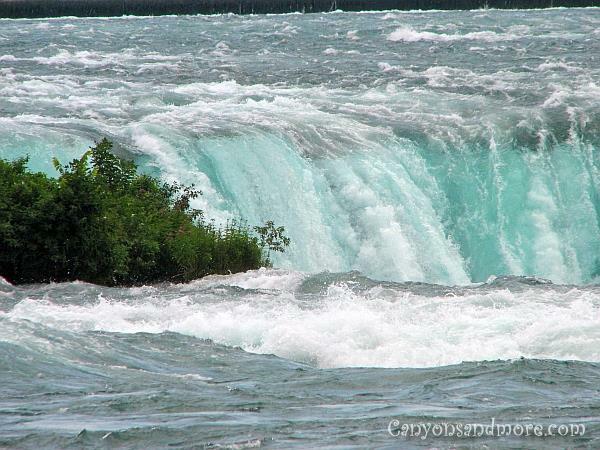 These images were made in the state of New York at the Niagara Falls. One feels so awe inspired when standing at this powerful and natural landscape. The image above shows just how close you can get to the falls. If you would like to see the falls by day, you can enjoy it the most during the morning hours before crowds of people are there. Around noon it gets quite full at the park and the lines of people waiting to get on the ferries really really increase in length. Seeing the Niagara Falls is seeing Mother Nature at her best! There is so much strength in the flowing waters and it can be so meditating just watching and listening to the roaring sound. 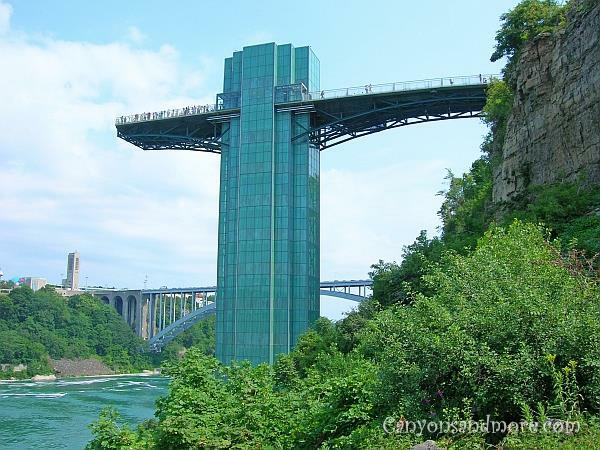 On the New York side of the falls, you can buy a $12.00/ adult ticket at the observation tower. From there, you can go up the tower to see the falls from above. It is an impressive view! When your purchase tickets at the observation tower to see the view from above, you receive a souvenier blue cape. And you will need it later. 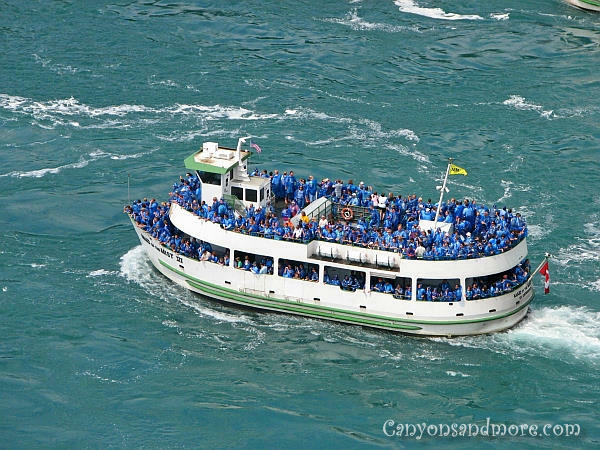 When finished at the tower, your ticket will also get you on the “Maid of the Mist” ferry which takes tourists right up in the falls. 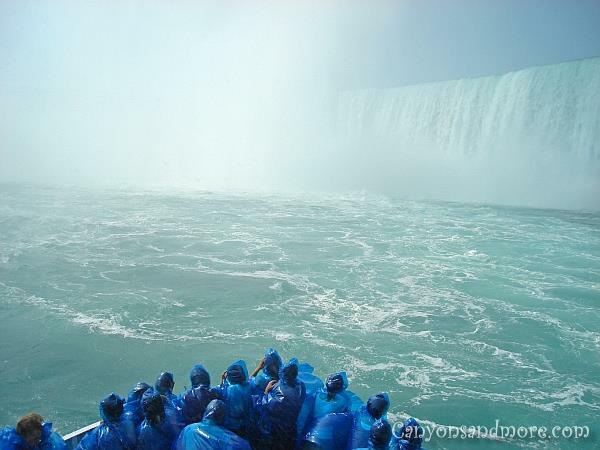 Taking a ride on the “Maid of the Mist” is a fantastic experience and should not be missed! Afterwards the ferry returns to the dock and can walk up a stairway alongside the falls to see it from a close view and to feel the cool fine mist of the water. Many people keep the capes on from the boat tour. These came in handy when walking through the park when you get too close to the water. It is not easy taking photos of this adventure as the fine mist keeps spraying the lenses. But one cannot resist. It looks so fantastic and feels great on a hot summer’s day. Vegetation thrives from the humidity of the water and the warm sun and if you are lucky, the sun is shining so that you can witness a gorgeous rainbow in the mist of the water. 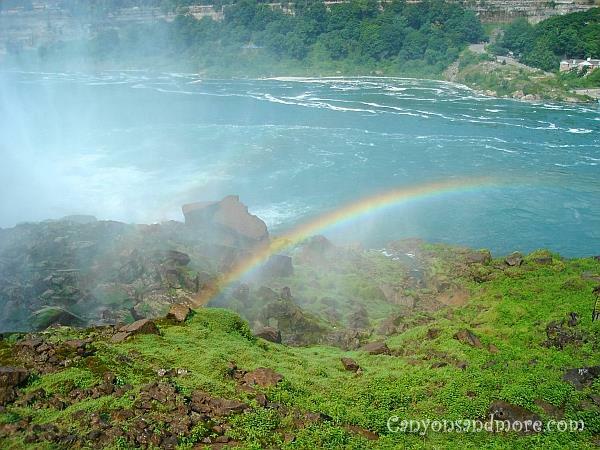 All the sun has to do is shine and the falls will do the rest to get a glimpse of a rainbow. If you take a close look, there is a second rainbow behind the front one. The hot summer day can have nothing on the vegetation. 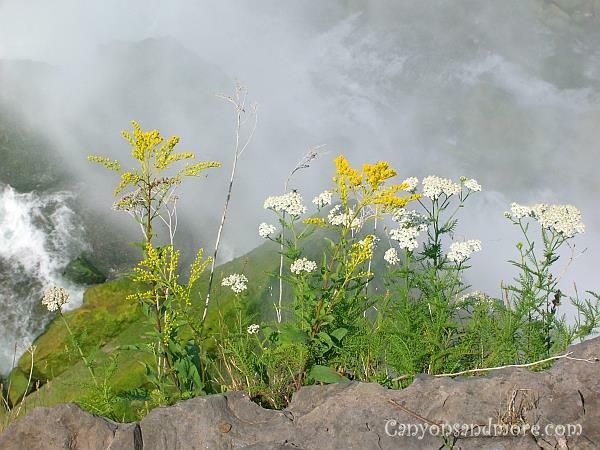 The cool mist of the falls keep them thriving and saturated with moisture. 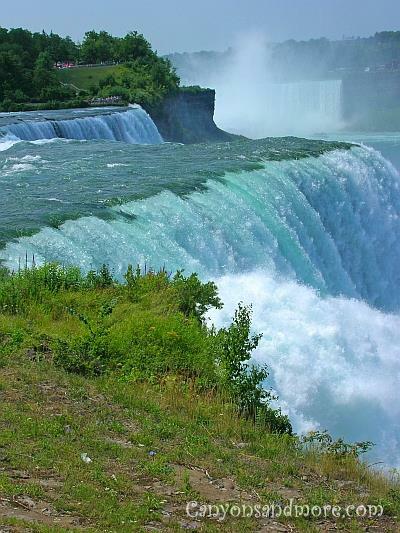 To get close to the Horseshoe Falls, you will take a walk through the Niagara Falls National Park. 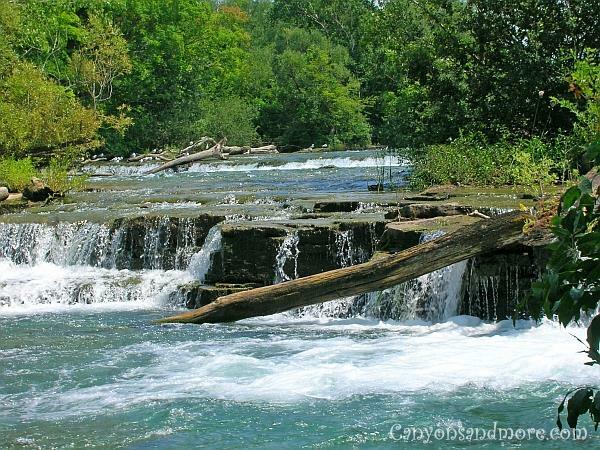 The trail leads you along the Niagara River and takes you to another breathtaking side of the falls. From here you can see the top of the falls and the river leading to it. The nature in this area is beautiful and many birds such as gulls seem to like the area as well. It is worth the time needed to get there. From here, you can see the Niagara River from different angles. It is amazing how close you can get to the water. It was almost a feeling like you could jump in. In the distance is the Rainbow Bridge. Tourists can walk or drive over it to the Canadian side. 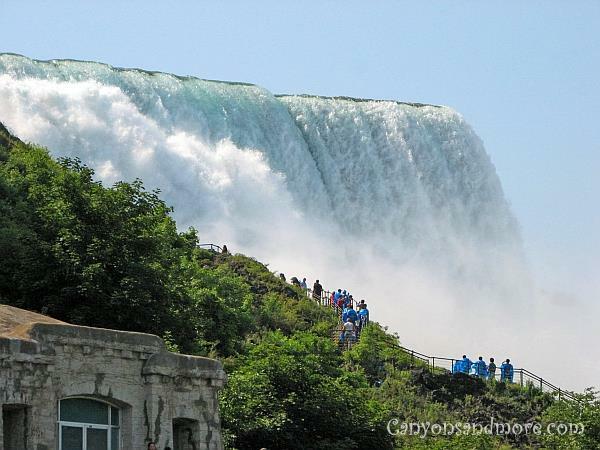 From that side, tourists can get a glimpse of the front of both the Niagara Falls and the Horseshoe Falls. Surpisingly, the falls are not flowing at full strength. Up the river, the flow is being controlled to prevent the speed of erosion. But even at this velocity, it seems quite powerful. At night you can get some interesting pictures of the falls. 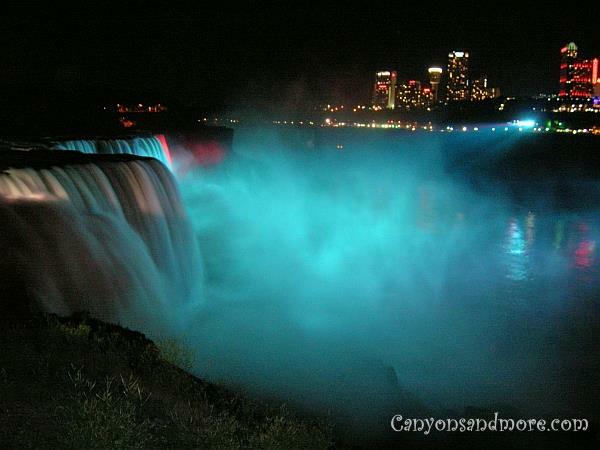 Beams of light directed at the falls change colors randomly to make the falls a colorful spectacle.